BETHESDA, Md., May 11, 2016 – ROSS Companies, a leader in multifamily acquisitions, property management and renovation, today announced that it was named an honoree in the large company category Monday night during the Family Business Award ceremony. ROSS earned the distinction for its innovative approach to the acquisition, property management, and renovation of apartment communities throughout the Mid-Atlantic region. 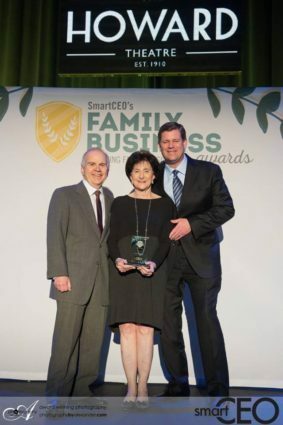 SmartCEO recognizes family-owned businesses that have built a legacy that will last for generations to celebrate the more than two-thirds of privately held businesses in the U.S. that are family owned. Established in 1983, ROSS Companies has built a competitive advantage through its people, who have deep and broad knowledge of Mid-Atlantic rental markets. The company has been acquiring and managing apartment communities in the Mid-Atlantic region since its inception, enabling it to develop an unmatched understanding of every intricacy of the apartment market in the region. In fact, the senior leadership team brings more than 100 years of multifamily industry experience in the Mid-Atlantic. “Because of our experience, we know what services and amenities apartment residents are willing to pay more to have and what submarkets perform better than others no matter the classification of the apartment community,” said Beth Ross, president of ROSS Management Services, an affiliate of ROSS Companies. ROSS has been able to sustain its leadership team and associates throughout the company because of its strong culture, which is built on its core values and basic principles, which include transparency, integrity, honesty, accountability and an open door policy. ROSS Companies, founded in 1983 in Bethesda, Md., is a recognized leader in multi-family acquisitions and investment, development, property management and renovation. With a managed portfolio of more than 11,000 apartment homes in 32 communities, the privately held company is one of the most active multifamily real estate firms in the Mid-Atlantic region. ROSS Companies is comprised of three affiliates – ROSS Development & Investment, ROSS Management Services and ROSS Renovation & Construction. In 2015, ROSS Development & Investment is celebrating its 31st anniversary and ROSS Management Services is celebrating 26 years in business. In March, ROSS Management Services was honored for the second straight year with a National Resident Satisfaction Award from SatisFacts. In 2015, 19 ROSS-managed apartment communities were awarded the Apartment Ratings’ 2014 Top Rated Award, reflecting ROSS Companies’ unwavering commitment to customer satisfaction. These annual awards recognize communities with outstanding resident satisfaction ratings as measured on ApartmentRatings.com. For more information about ROSS Companies, visit TheRossCompanies.com.